Betters watch the races on the TV screens in anticipation at Hollywood Park Friday, November 2, in Inglewood, CA. Cal State Fullerton student and SportsShooter.com member Carlos Delgado won the second Photo of the Day at Sports Shooter Academy III currently underway in Southern California. 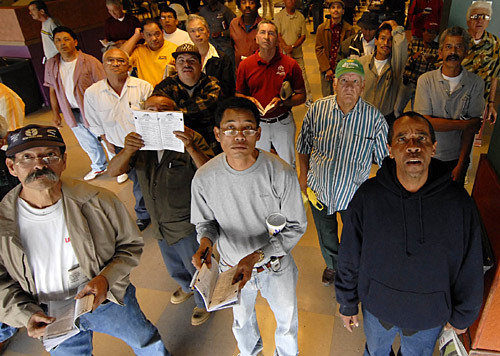 Delgado's photograph of betters staring at TV monitors at Hollywood Park Race Track was described by workshop faculty member and SportsShooter.com member Donald Miralle of Getty Images as "unique" and attention-grabbing". an airborne soccer goalie missing a shot block during the Big West Conference Women's Soccer Tournament taken by SportsShooter.com member Joy Absalon. "You have to love that (Delgado) went inside, went away from the usual action photo and looked for a feature photo," Miralle added. something different. There are so many interesting faces in this photograph it makes you stop and look at it for a long time." Other sports on the workshop schedule Friday were volleyball, swimming and diving, rugby and beach volleyball. Also Miralle conducted an underwater photography session prior to a group of SSA participants covering the Annual Big West Shootout Swim Meet. The Sports Shooter Academy III is a hands-on, shooting workshop that enables participants to photograph several real sports events each day under the guidance of an award-winning faculty. Each evening the day's work is edited, critiqued and reviewed before the entire group. The NCAA Division I Big West Conference is providing SSA III participants with credentials to all of its events being held during the workshop. A gallery of SSA III participants' work is on the Big West Conference website and updated with each day's work: http://bigwest.org/info/shooter/. "I was impressed with the soccer action photo because it was tight and shot through the net," said SSA III faculty member and SportsShooter.com member Myung J. Chun of the Los Angeles Times, "You know how hard it is to shoot through the net and have a shot like this tack sharp?" The Sports Shooter Academy continues through Sunday, November 5, 2006 and is sponsored by Canon, USA, Think Tank Photo and Samy's Camera. Prizes will be given to each individual "Photo of the Day" as well as the Best Single Photo (produced during SSA III) and the Best Portfolio by a Student and the Best Portfolio by a Professional. Los Angeles Times, SportsShooter.com member Michael Goulding, a staff photographer from the Orange County Register and SportsShooter.com founding owner Robert Hanashiro, a staff photographer from USA TODAY. The Sports Shooter Academy concludes on Sunday, November 5, 2006.